See how easy it is to take classic quilt blocks and create fresh, modern looks. 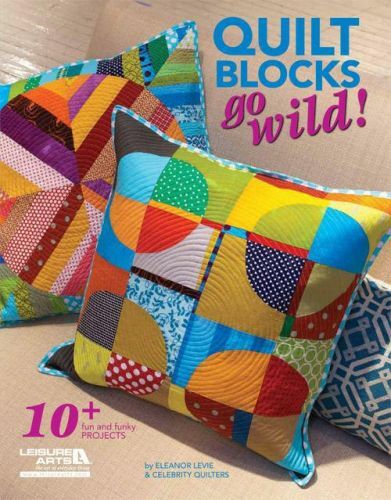 Drunkards Off the Path, Rail Fence Derailed, Squares Out of Square, a Log Cabin Split Level, a Star Partly Crazy, plus skewed nine-patches, wonky hearts, and a bonkers basket---these and more will inspire you to go wild in your quiltmaking! Karla Anderson of Stack the Deck, Pamela Dinndorf of Aarvark Quilts, Malka Dubrawsky of Fresh Quilts, Tonya Ricucci of Word Play Quilts, Elizabeth Rosenberg whose award-winning work was recently shown on Quilt Out Loud all join me in presenting 10 fun and funky blocks and 10 fabulous projects in which to use any of them. Easy, accurate how-to's and over 125 step-by-step photos make sure you'll be wild, but never bewildered! And workbook---er, that is to say, playbook exercises help you rock tradition and create your own original blocks and designs. I just bet you'll go wild for this book!